Drawing on years of experience with LEED and providing education materials to those within the green building industry, GBES study materials allow candidates with a wide variety of backgrounds to pass their exams. Furthermore, GBES materials are constantly updated to reflect both feedback from students and changes to the exam and LEED certifications. Therefore, students can confidently study with GBES knowing that the information is up-to-date and student-centered. 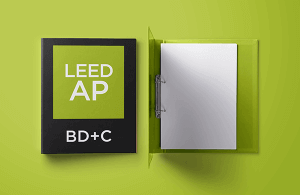 Our LEED AP BD+C Study Guide provides a structured overview of the LEED BD+C Exam and the certification process. The study guide is a resource to pre-test your skills and guide you to your ultimate goal of becoming a LEED AP BD+C. It helps you confirm if you are fully prepared for your LEED Exam, or to identify areas that you may need more study time prior to taking in identified topics.